Delivering a 55 gallon drum full of temperature-sensitive liquid content may be tricky especially during winter season. 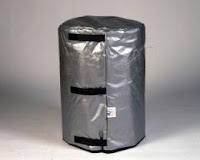 If we want to avoid trouble with clients regarding their frozen contents, it may be a good idea to stock one or some of these 55 gallon Non-Electric Drum Insulator Blankets. Also great to prevent freezing on storage drums, the non-electric drum insulator blanket acts as an excellent barrier between drums and elements like heat, freezing and condensation damage. It’s all thanks to the patented multilayer insulating technology applied to this blanket. The layered insulating system is made to deliver non-mechanical thermal variation protection to the blanketed drum. Each layer is meant to act as a barrier to any heat transfer mechanisms, including convection, moisture, conduction and radiation. The insulator blanket is ruggedly built and designed for easy installation. Contact us if you are interested in this product.